This function can be call using the [F12] key. 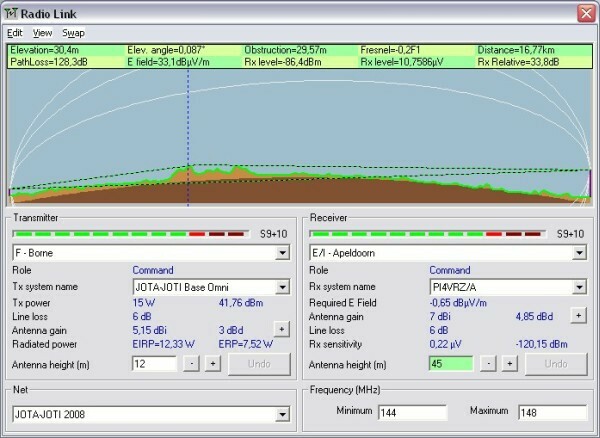 Opens a form in order to initiate analysis of the Radio link from a point to a point. The points in this analysis are objects and retrieved from a network. Also it is possible to analyse from the transmitter to any point on the radio link. This point has to be clicked on by the mouse. 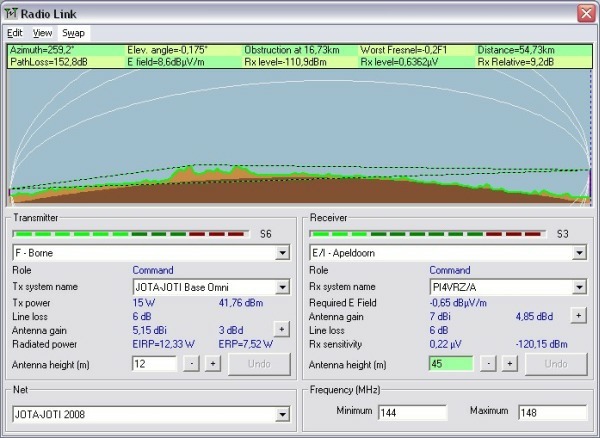 The radio link tool enables to evaluate a radio link. All relevant information is displayed in this tool. On the bottom of the window the Transmitter, Receiver, Net and frequency are displayed. 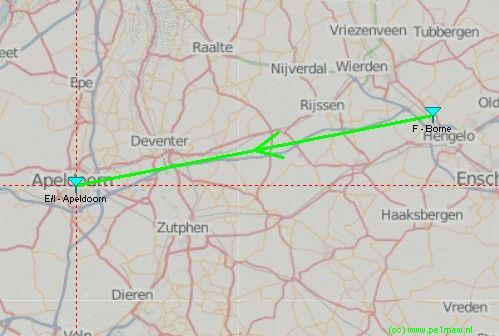 The radio link is directly coupled to the current map window and displays on the map the analysed radio link. 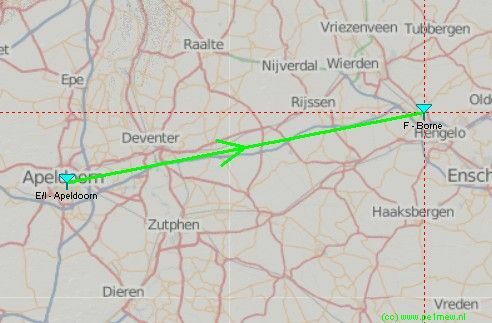 The cursor is set at the RX unit and the complete radio link is analysed. The swap function swaps the TX and RX unit. Initial the frequency is copied from the 'Network properties - Parameters' but can be changed to the meet the requirements for the analysis. This is the net in which both Transmitter and receiver are member. When Transmitter and receiverare member of more Nets those nets can be selected. This information applies to the Transmitter in the evaluated link. Through a pull-down menu the required Transmitting unit can be selected. TX power of the transmitting unit as applied to the unit by the selected system. The power is expressed in Watts and dB. Line loss in dB between the transmitter and the antenna of the transmitting unit as applied to the unit by the selected system. Using the [+] button the applied antenna pattern can be viewed. 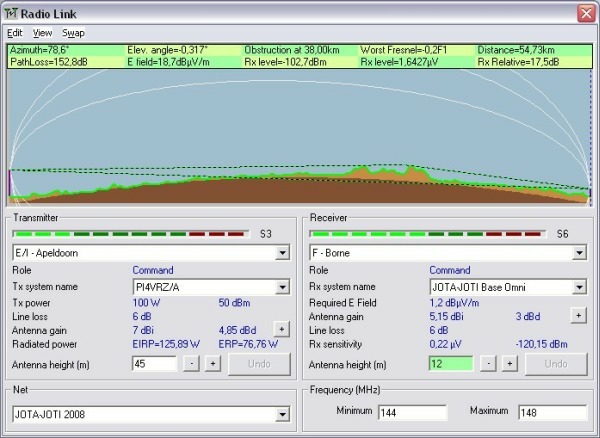 The purple line in the antenna pattern viewer displays the direction of the radio link with respect to the unit. Using the [-] and [+] button the antenna height can be altered in 0.1 meter steps. Also it is possible to enter the antenna height directly. The by the receiver required E-field in dB(uV/m). This is the real fieldstrength required at the antenna and is calculated from RX sensitivity, line loss, and antenna gain. Using the [+] button the applied antenna pattern can be viewed. 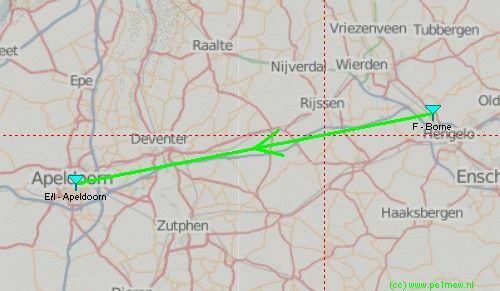 The purple line in the antenna pattern viewer displays the direction of the radio link with respectto the unit. RX Sensitivity of the receiver in uV and dBm at 50 ohms.